I just ordered the Lowepro Cirrus TLZ 25 camera bag and the Canon EF-S 55-250mm f/4-5.6 IS lens for my Canon EOS 450D dSLR camera. I already have the EF-S 18-55mm IS kit lens and this new lens should give me more zooming power. 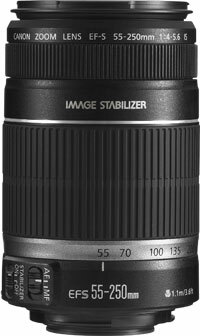 The 55-250mm lens features Image Stabilization (IS) and according to many people who bought this lens it’s one of the best you can get in its price class.